I decided to go to Bukchon Hanok Village (북촌한옥마을) for my first destination. The village is basically a collection of houses called "hanok" from the Joseon Dynasty. Although its a tourist location people actually live in the houses! The village is a collection of both old and new. During lunch time a weird thing happened, suddenly all these business men and women suddenly appeared out of nowhere! There's not a single corporate building for miles. Next I headed to the Dongdaemun area for Heunginjimun Gate (동대문 - 흥인지문) unfortunately it was closed so I decided to do a little shopping around the area. 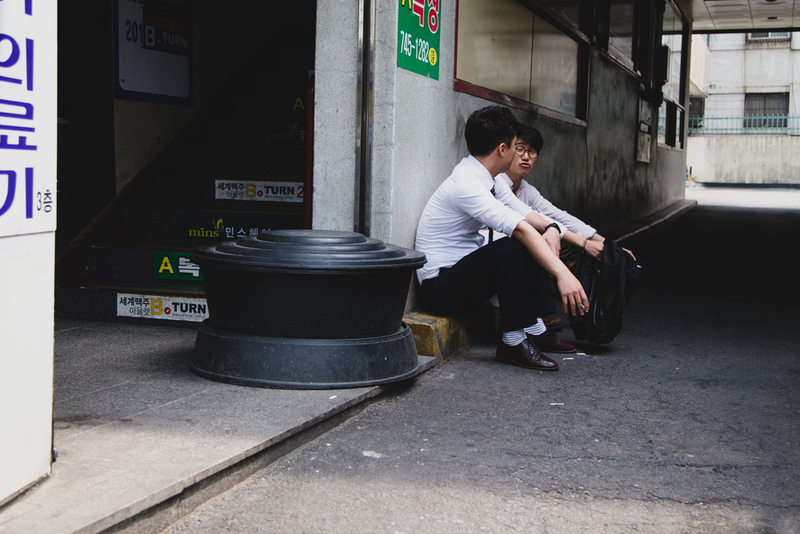 There was such a big change in atmosphere going from Bukchon's peaceful (and clean) neighborhoods to the bustling streets around Dongdaemun. "I ride wherever I feel like it"
I was not prepared for the "shopping" that I intended. I went to Pyounghwa Fashion Town market where you can find every fashion clothing and accessory possible. There was literally so much clothes it nearly gave me a headache! Forever 21 needs to step up its game. Much of the shopping complex had wholesale floors where you could buy stuff in bulk. There a floor literally just dedicated to buttons. lots and lots of buttons. Went to Cheonggyecheon Stream for some much needed air. The last stop for the day was Dongdaemun Design Plaza (동대문디자인플라자(DDP)). It's filled with all sorts of cool designs from artists across Seoul. inside the floors were covered in these holes that blew up cool air. Not mention they're kind of trippy to look at too.